Next week we welcome world class master teacher, Tias Little, to our studio right here in Orleans! Many of us here at Orleans Yoga credit Tias as a primary and profound teacher on our paths, we are so very fortunate to have him here for this sold out 5-day Prajna Yoga Immersion. Please join us in welcoming him, and the yogis traveling from all over the country to study with him here, to Orleans Yoga. Because we have two practice spaces, we will not have to cancel any regular classes during the immersion! They will all be held, with limited capacity, in the small studio. So that we can best accommodate this very special event, we ask for your gracious cooperation and patience with this temporary shift of operations. 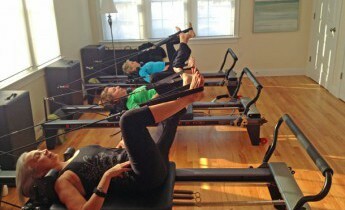 *Regularly scheduled classes will be held in the small studio. *Class size will be limited to 15 students. Please reserve your spot in your favorite classes online or at the front desk ahead of time. If you reserve in advance and do not show up for the class, you will still be charged, due to the limited class size. Please cancel in advance if you find you cannot make it. As sound carries easily in our space, we also ask that everyone keep voices soft and move outside for conversations while all programs and classes are in session. Thank you in advance for your help in making this wonderful event possible! 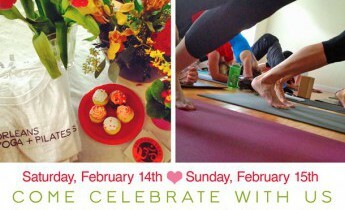 Birthday Celebration: OYP is Turning 2! 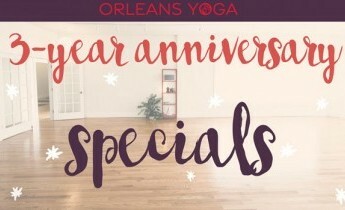 3-Year Anniversary Specials: Now Available!